Grain Covers - Reusable Grain Tarps | Reef Industries, Inc. Protect grain from adverse weather conditions with Griffolyn® grain covers. Griffolyn® reinforced polyethylene laminates can handle daily and seasonal use, year after year. This product is designed to resist tears, abrasions and the elements. Griffolyn® grain covers retain their strength and flexibility in extreme temperatures and rugged conditions. They are UV stabilized to withstand sun exposure, scrim reinforced for high strength and will not rot or mildew. 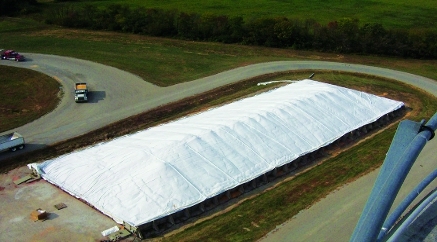 Griffolyn® grain covers are a cost-effective solution to ground storage problems. Griffolyn® TX-1600 is a 3-ply laminate combining 2 layers of U.V. stabilized coextruded polyethylene and a high strength cord grid. It is specifically engineered to provide high strength and durability in a lightweight material. Griffolyn® TX-1200 is a 3-ply laminate combining two layers of linear low density polyethylene and a high-strength cord grid. It is specifically engineered to provide high strength and durability in a lightweight material.